An interesting post from Karie Bookish: “On Devaluating Hand-knitting.” Perennially difficult subject: getting paid fairly for handknitting. Can anybody think of a way to improve this age-old problem? I’ve been motoring away on a cowl that threatens to become a piece of furniture. 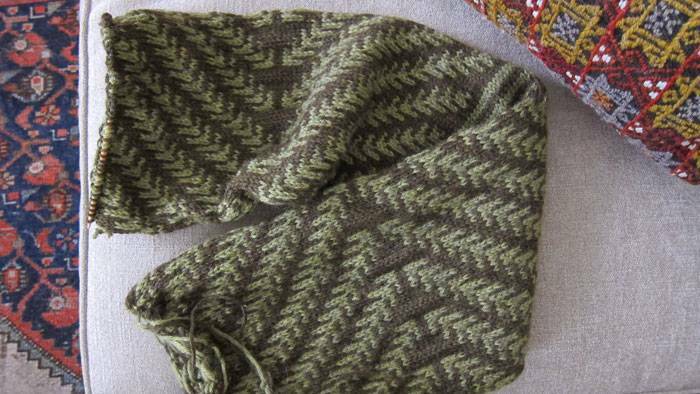 It’s the Pine Bough Cowl by Dianna-Potter-now-Dianna-Walla. It’s stranded, knit in the round, to be the sort of cowl you would want to wear when you’re shy a malamute and you’ve got 300 miles of Iditarod ahead of you. If you have a yen to try Fair Isle, this is an absolute winner. Low stakes: the floats never see the light of day, and it goes on long enough that you can get your Fair Isle sea legs under you. You never have to swap out colors, but the pattern is pretty, even in two colors. I am always on the prowl for the modern-looking Fair Isle. I haven’t knit with the specified yarn, Kenzie by Hikoo, but it sounds drapier than the stashy Cascade 220 I’m using, and I think this pattern would benefit from a drapey yarn. I have the most colossal startitis right now. How’s that gift-knitting coming along? PS Re the deep controversy of Carrie Underwood as Maria von Trapp . . . In the interest of keeping an open mind, I will watch this Sound of Music Live on December 5, and we’ll do a side-by-side comparison of “Something Good.” That’s the acid test: “Something Good” is basically a sigh of a song, and I’ve never heard Carrie Underwood sing at less than 120 decibels. If she pulls that off, I’ll eat my cowl. However, the cowl looks cool… Does it ever get double-thick-fair-isle cold where you are? It rarely gets single-thick-fair-isle cold in Nashville, but at the moment it’s fricking triple-thick weather: sleet and snow and damp. LOVING IT. As a tried and true SoM geek, I share your apprehension. Can a country singer pull this off? However, I think Something Good was written as filler just for the movie, so if they are working off of the book from the original show (a la Mary Martin), we will not have to sit through that song..fingers crossed! I am worried about having to eat my cowl, so this is excellent news. I’ve never eaten a handknit before. Having just spent a fall living with Captain Von Trapp aka my younger son who capped his senior year by nabbing that. very. role., I can vouch for the fact that the stage production doesn’t have “Something Good” (which I, too, disliked, despite having a huge crush on C. Plummer as a child) in it; it also has two zippy little numbers between Max and Elsa about going along with the Nazi invaders. Who knew? But if it’s that version (and the costume Maria is wearing in the publicity is total rip off of the movie, so who knows? ), your cowl should be safe. Please video tape the consumption of the cowl. Will that be plain…or with condiments? I’m thinking it’s going to need a braising in a sturdy cabernet. I loved watching the SoM every year with my sister and mother when it came on TV. I am not sold on the Carrie Underwood version, but will give it a chance. I will not, however, let my daughter’s first Sound of Music experience be THAT version. She is going to have to watch the Julie Andrews version first! Teach her to say “playclothes” the way Julie Andrews does. She gets every single letter out of that word. Left a LENGTHY post at Karie Bookish with thoughts on the making for money and valuation. Can I even sum up? It’s a hobby for many. I don’t value only my end products, but the fun I have in making them. Looking at that from the outside, it’s easy to think – “you could have your fun doing the making, and I could have a beautiful thing that I otherwise couldn’t afford or isn’t available.” If I was a cookie-baking hobbyist and someone asked me for a special batch of cookies, I’d be flattered and pleased and happy to give them what might amount to an hour of my time and $10 worth of ingredients. So – it’s hard for me to side with taking offense at the innocent askers. Of course, there are not-so-innocent askers. And it can be hard to explain why you make other things for other people for fun but being told what to make is not so fun, and that actually you are dying to knit at least one hundred other things that is NOT that thing for them. Also, in terms of how to value – what is the value? It’s different things for different people at different times. Recycled/donated materials + lots of free time means it’s a college student’s value in making holiday gifts for “free.” It’s an act of love for a friend having a baby. It’s the beautiful sweater that actually fits for yourself. It’s something to keep your hands busy and therefore your eyes open while sitting through the skate park with your boys or through that sci-fi movie with your husband. It’s not necessarily always an undervaluing, but a different valuing. I’d be interested in whether Mr. Ann (Mr. Hazzard) has any economic thoughts on other goods that may have a similar valuation problem. I agree about innocent askers–most people truly don’t know what handknitting is all about. The production knitting is where I worry. It’s hard to knit fast enough to make knitting a viable work option. I will alert Mr. Hazard about your valuation question. He thinks about valuation the way I think about chocolate: often and in a superfocused way. Lovely cowl, but why does your cat look a) angry that you’re making a cowl or b) angry that the cowl isn’t for her/him? As for Carrie Underwood as Maria von Trapp. No. Just no. He tried to climb in the tube and failed. The only thing to do when being asked to design and make a fairisle, 4-ply sweater for £35 is to say ‘no’, politely, if it’s for a client. Different matter altogether if it’s for a friend. But as a job of work? Say no. Easy as that. Not worth the time and effort. A properly designed swatch costs more than that in terms of yarn and time. Yes! Pro versus amateur is an important distinction to make. As an amateur, I’d rather knit something for free, and give it as a present than knit something for fifty bucks and be crabby the whole time that it ought to have been two hundred bucks. First thought: what a beautiful cat! He looks as if he just came from the groomer. Then I saw the pillow on your couch and thought “Ohio Star”–so many quilting and patchwork patterns are based on ancient symbols that seem to pop up randomly throughout my life. So. I was excited already, but the seeing your work in progress made me make a litte gasp! It’s so nice! I like the clean lines, and wish I had time to make it my first Fairisle. As far as the Carrie Conundrum, I don’t know much about her singing, but I do wish they left the whole thing alone and leave the original to stand by itself. On the other hand, Bette Midler did a pretty good job in the re-make of Stella Dallas…. Re: charging for the garments we knit, my question is: how much did Mr.Bill Cosby pay for each of those sweaters that he wore on his show? (BTW, his website is hosting a contest about those sweaters). Ohio Star! I’ll never look at that pillow the same way again–thanks for redeeming it as an example of an ancient symbol and not as the pillow so scratchy that I usually have it flipped over! Another deep Sound of Music controversy! Is “Something Good” a good song or not? Personally I think it has a lovely melody but the lyrics are kind of theologically controversial, for a former Catholic nun. Looking forward to seeing how well Carrie can yodel. I’ve heard that the live production next week will be based on the original book, and that’s good, because it will give Audra McDonald, Laura Benanti and Christian Borle more to do in their roles as the Reverend Mother, the Baroness and Max. They are fabulous vocalists and actors! But, probably, no “Something Good,” which is not bad. Who’s playing the Lonely Goatherd? Very worried about the casting on that one. That is one gorgeous, although grumpy looking cat. And that cowl is enough to make me jump into the Fair Isle pool again. I’m actually wondering if I have the time to complete one in time to gift for the holidays or if I should stick to my original plan of giving each of the three nieces a Bubble Wrap cowl. I’m with Erin about Carrie Underwood – while she may do a decent job, I think everyone’s initial memory of Maria should be the earlier version. The only person I know personally who would vehemently disagree with me is my 18-month old great nephew. He will drop anything and everything for Carrie Underwood (his parents have CMT on a lot) … and Mickey Mouse. If she turns out to be awful, clear your head with the Antwerp Train station version of Do Re Mi. It makes me so happy every time I see it. I love the Antwerp SoM! Millions of actresses/singers have played Maria – just not on the silver screen. I’m happy to watch someone new – I love the songs. I was going to comment on the “value” question, but after reading the above comments I have a far more pressing question: WHAT cat? Where is the cat people are writing about? Why can’t I see it? I want to seeeeeeee ittttttt!!!!! Yeah, I see no cat, either. This is berrry mysterious. So sorry! At the top of the blog is a giant photo that changes with each blog entry. Are you accessing http://www.masondixonknitting.com? Are you using a blog-reader service of some sort? Pray tell what browser thou useth, and if you’re on a device other than a computer. The cat IS looking unusually fluffy today. Now! I wrote that comment, submitted, went back to the main page and there was no cat! Magic! I’m replying to say a) that’s so weird, b) thank you for telling me this, and c) look how little comments get when there are a bunch of replies! I’m using Chrome, on a laptop, and the URL is as you write it. After reading your reply, I went back and looked at the post in my reader (feedly) and still no kitty. Also, for a while, I was getting your new posts in my blog list but not on feedly, and I still don’t know why that was happening or why it is now working correctly in both places. In other tech news, as of today, my mouse button that makes scrolling go in nice clickety-steps instead of wildly careening up and down the screen is suddenly BROKEN. Twitter is SO Much Less Fun at the moment. I am hoping a good night’s sleep will fix the mouse button. What’re the odds? FYI – for a modern-looking stranded cowl (also hides the floats) try the Bogolan cowl (on ravelry). Isn’t that Carrie doing the old faith hill bit on Sunday night football? You can barely hear her! I continue to mourn the loss of Faith Hill in that role. Yeah, the pic changes crop and the cat then disappears. Weird but this is about a cat and they seem to prefer not being pinned down. Trying to find someone to make that cowl for as a Christmas gift. What do you mean, is there enough time?? Thanks, Diane! Not everyone is as helpful. Now I’ve got something to do! Ok, I figured out what happened for me with the cat. When I am in the “read comments” section, the photo is cropped without the cat. When I’m on the homepage of the site, then the photo is wider and the cat is there. Really, I think that cat photo deserves a caption contest. I want to see that gorgeous cat, too!! I’ll try coming back and see if it comes up. But first, I want to know more about that cowl. I love it. And it’s scary cold in MN today (4) and going to get worse. Need something warm to work on. Is it per pattern? It looks narrower. Thanks!